Nicole Hemmer is Assistant Professor of Presidential Studies at the University of Virginia’s Miller Center, a contributing editor at U.S. News & World Report, and co-host of the Past Present Podcast. 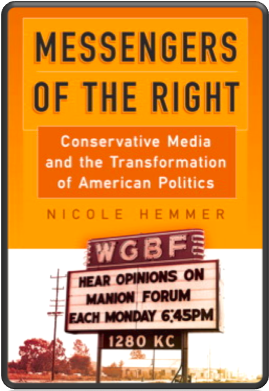 Her book, Messengers of the Right: Conservative Media and the Transformation of American Politics, tells the origin story of activist conservative media. ECM: You identify Rush Limbaugh and Fox News as “second generation” conservative media institutions. Who were their predecessors? How far back do they go? NH: All the way back to the mid-1940s! The first generation begins with the founding of Human Events, a little four-page newsletter published out of Chicago. Human Events grew out of the anti-intervention movement in World War II, both in terms of personnel and patrons. Its founders, Frank Hanighen and Felix Morley, were conservative pacifists who drew their start-up funds from some of the most prominent members of the America First Committee. ECM: Contemporary conservative media personalities tend to draw pretty heavily on a God-and-Country ethos. Were these earlier figures overtly religious? NH: Yes, but in different ways depending on the person in question. The first generation of conservative media activists can be divided into two groups. The central figures, like Manion, Regnery, and Rusher, were driven primarily by politics. Their religious faith informed their politics, but religion was not their central cause. Another, somewhat tangential group like Billy James Hargis of Christian Crusade and Carl McIntire of The Twentieth Century Reformation Hour wanted to win souls first, votes second. This entry was posted in Culture War, Politics and tagged Breitbart, Conservative Media, Nicole Hemmer. Bookmark the permalink.